This is one of those things that can be accomplished in a more direct route but it’s so cool that I need to show you how to do this. 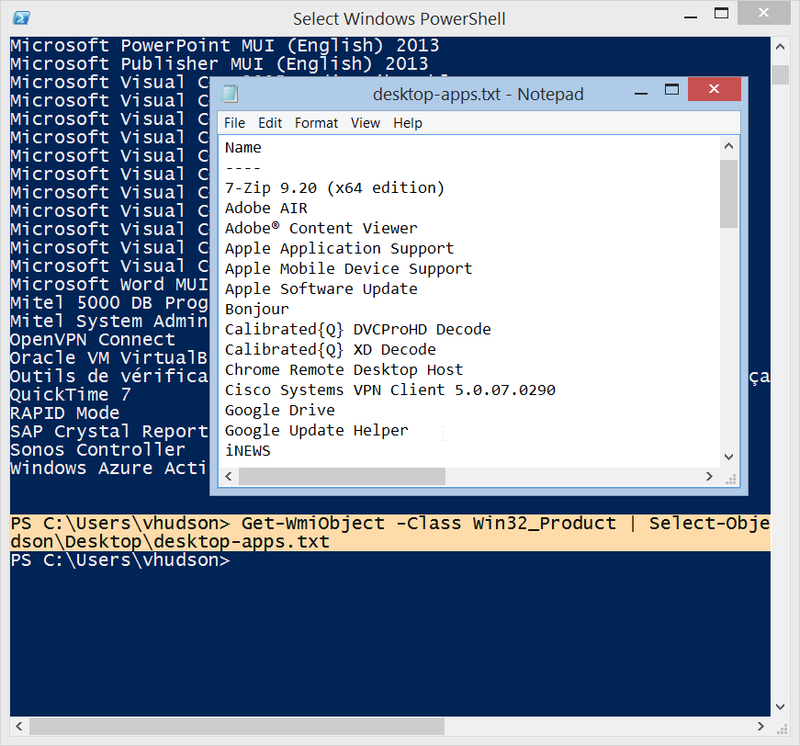 Microsoft Powershell is an extremely nimble and robust command-line tool that lets you automate mundane tasks on local and remote machines. 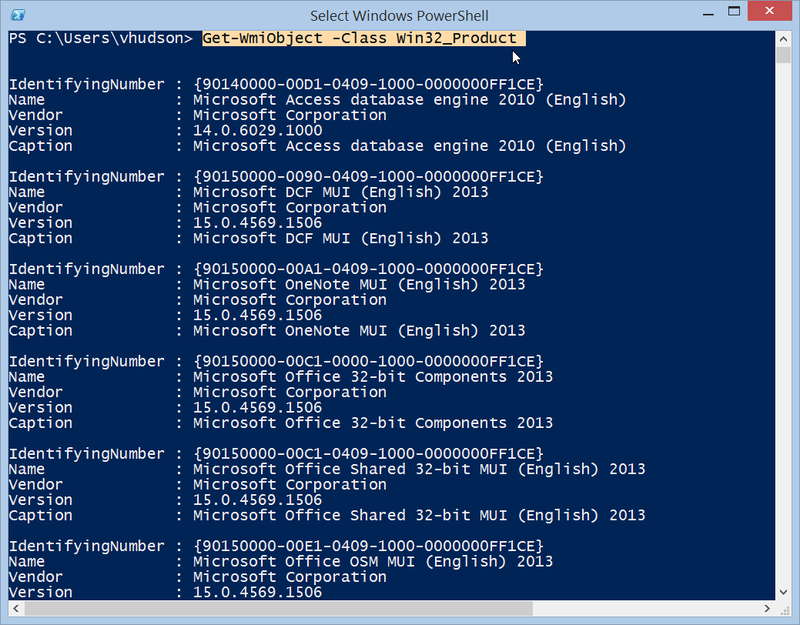 The real power from Powershell stems from the command utilities that let you do stuff such as systems administration and importing data. Today I just want to focus on one little command that lets you list all the programs currently installed on your computer. But I contend that using Powershell to accomplish the same task is the recondite path to geekhood. We’re going to use the Get-WmiObject cmdlet to list all the programs currently installed on your computer. Then I’ll show you how to save the results to a file and we’ll finish with a neat trick that compares the installed programs between two PC’s. You should the familiar blue icon appear in the search results. I call it the “BlueScreen of Life” because it’s the complete antithesis to its morbid cousin who loves to crash your computer: the notorious BlueScreen of Death. The above Get-WmiObject command we typed above references the Win32_Product class which represents products as they are installed by the Windows installer. But our results are less than satisfying. The patent problem with this command is that it’s virtually unintelligible. There’s way too much information and each software package is sorted by an arcane identifying number that is utterly useless to mere mortals like you and me. Do you see that Select-Object -Property Name business? We’re just telling PowerShell to refine the results to just the Name. That is, we only care about the name of the application. All that other crap about Vendor, Version and Caption is superfluous. Why are the programs still out of order? 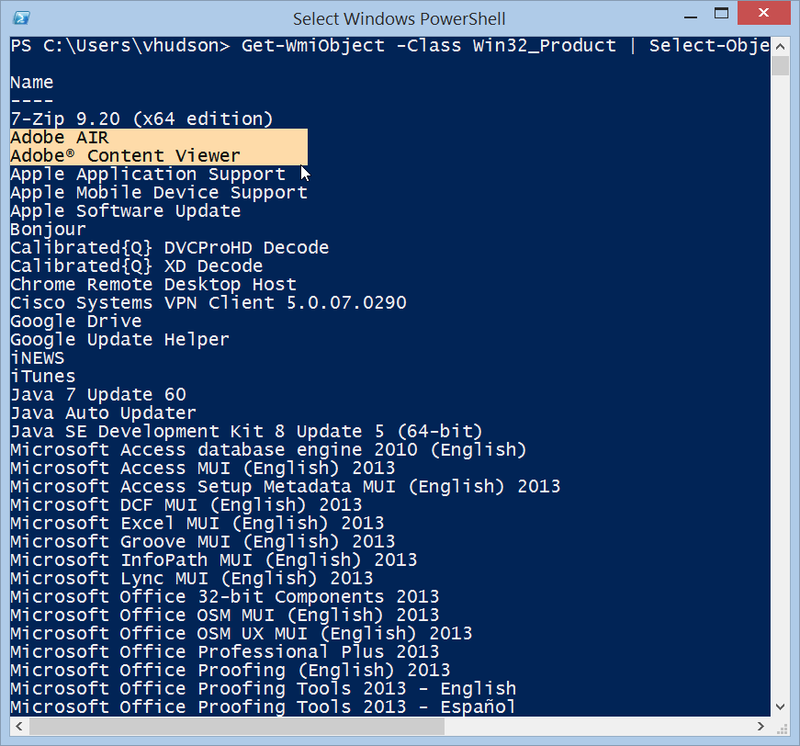 Why does Adobe Indesign CC 2014 show up in Programs and Features but not PowerShell? The issue is that programs are still listed by the now invisible identifying number. So how do we get it to sort by the application name? Ahh, that’s better but Adobe Indesign CC 2014 is still missing from the list. The Win32_Product class can only display applications installed using the Windows installer. 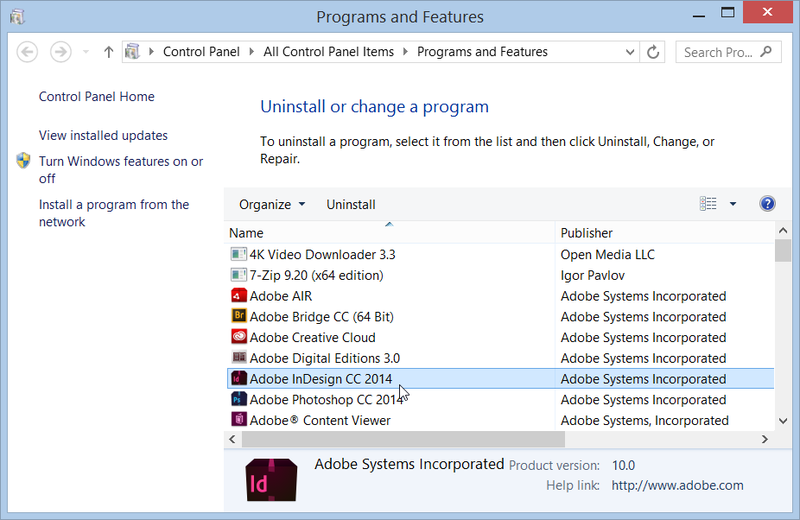 The Adobe application suite is provisioned through the Creative Cloud application suite which isn’t based on the Windows installer framework. 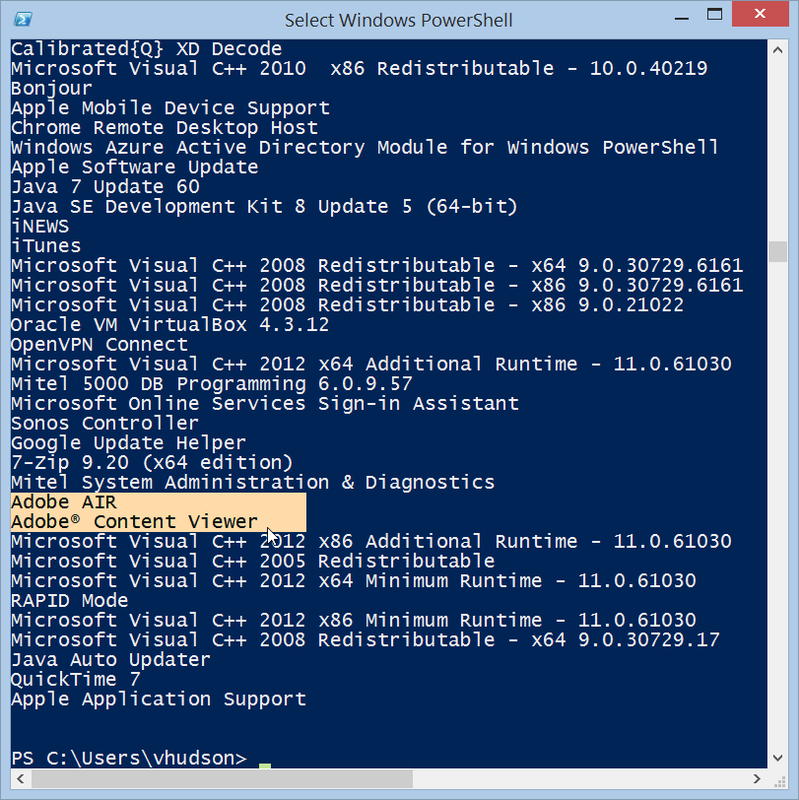 The concomitant result is that the Adobe product line doesn’t show up in our PowerShell output. This is unfortunately one of the limitations of this PowerShell command; however, if you know how to list all the applications please let me know in the comments below. So what else can you do besides shoot off an alphabetical list of most of your programs? Well, you can pipe it to a text file by simply adding the greater than sign and the full path to a new file. If the file doesn’t already exist, PowerShell will automatically create it for us. Now if you want to compare the text files we can use the Compare-Object cmdlet with -ReferenceObject and -DifferenceObject to accentuate the differences between them. Alright so I’ve got two files. This might look a little crazy but if you study it for a few seconds you can see I’m using the Get-Content cmdlet to grab the content of each text file and then the -ReferenceObject and -DifferenceObject options provide the reference points for the SideIndicator arrows. We defined the apps on my computer, desktop-apps.txt, as the reference set and the apps on Peter’s computer as the difference set. In the SideIndicator column, when the arrow symbol points to the left like this (<=) it means that the value, in this case the application name, only appeared in the reference set. Similarly, where the arrow points to the right (=>) the application name only appeared in the difference set, Peter’s computer. If both sets are identical you’ll see the == symbol. One caveat is that you can keep using the Win32_Product class like we did in this tutorial; however, some experts say that it’s clunky and therefore not very efficient in a production environment. Since we’re only using this on our local computer it shouldn’t be a big deal but it’s worth nothing that it might not be apt across networked environments. However Win32Reg_AddRemovePrograms isn’t a standard Microsoft class and is only available by installing System Center 2012. Also known as System Center Configuration Manager, SCCM is a software suite that lets you do a bunch of remote administration stuff such as push software, install updates and run various reports. SCCM used to be called Microsoft SMS but was rebranded as SCCM in 2007. You’ll need to have this installed before you can start using Win32Reg_AddRemovePrograms. If you don’t have it, don’t fret just keep using Win32_Product in non-production environments and you’ll be fine. ‹ How can I change the hostname of my Mac? 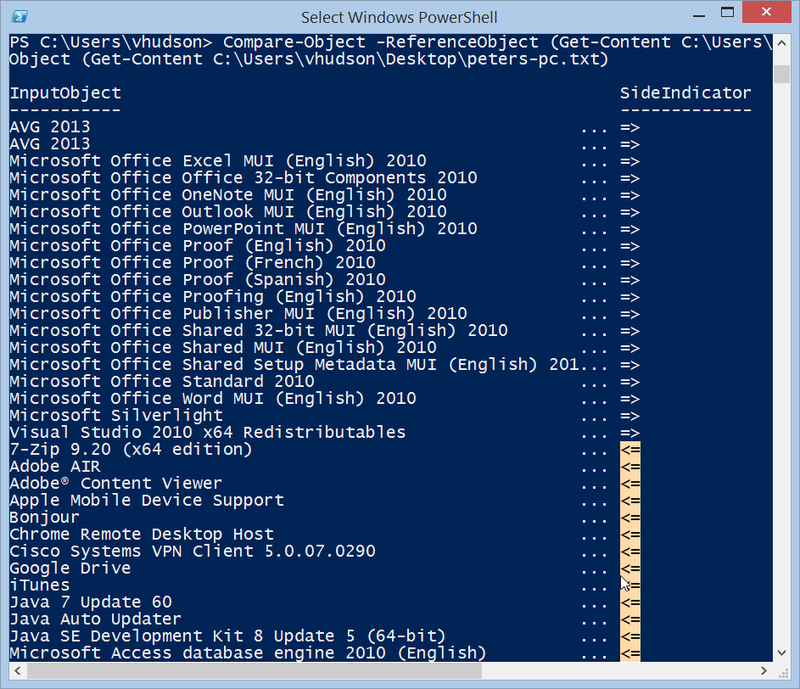 Can the WMIC command for CMD cater all the powershell commands you showed above.??? Did you found any ways to solve the above problem you stated regarding adobe indesign?? Your explanation of the pipeline is good and helpful, but — it’s now recommended to avoid queries to the Win32_Product class. Doing so has… side effects. I agree with AceyMan. Querying Win32_Product is not advised. I wrote a script that incorporated a query similar to this as well, as looking in Program Files and various other reg locations to find software, but the query to Win32_Product ended up causing problems that the links AceyMan provided. Unfortunately finding installed software is an ongoing issue with Windows. If there’s an easy way to get a complete list, I don’t know it. Works well and shows stuff pushed to the PC and not installed using Windows installer. Some help on how to extend to remote machines would be a huge benefit. I am a newbie but guess some kind of for …..next loop using the AD Computer containers might work but I have absolutely no idea how to do this. The Enable-PSRemoting command opens access through the firewall as well, but as with enabling any remote access / remote administration, the computer is now available to the outside world. It should be limited to just administrators, but as always, use with caution. You never know which admins are using crappy passwords. You can edit the firewall rule created by Enable-PSRemoting to restrict network access down to a small list of IP addresses that correspond to the administrator PCs if that helps. How can you uninstall a program that doesn’t show with win32_product using powershell? Using http://www.action1.com you can query all your endpoints for the list of installed software and filter by program name (e.g. which of your endpoints have a certain program installed). They offer freeware for up to 100 endpoints.